The size, beauty and styling of the Mayflower Class make a bold statement. She is traditionally built, but perfectly at home in the modern world. On the water she draws admiring glances and sits perfectly, whether alongside a pilot cutter, in a modern marina or racing in classic yacht regattas. Her design takes elements of the great English working boats and fuses them with refined, classic yacht touches from an age when yachts were objects of splendour. Every Mayflower interior is unique and designed with the owners' specific requirements in mind. The flexibility of the internal layout allows the yacht to be a family space, a liveaboard home or simply a luxurious cruiser for yourselves and friends. 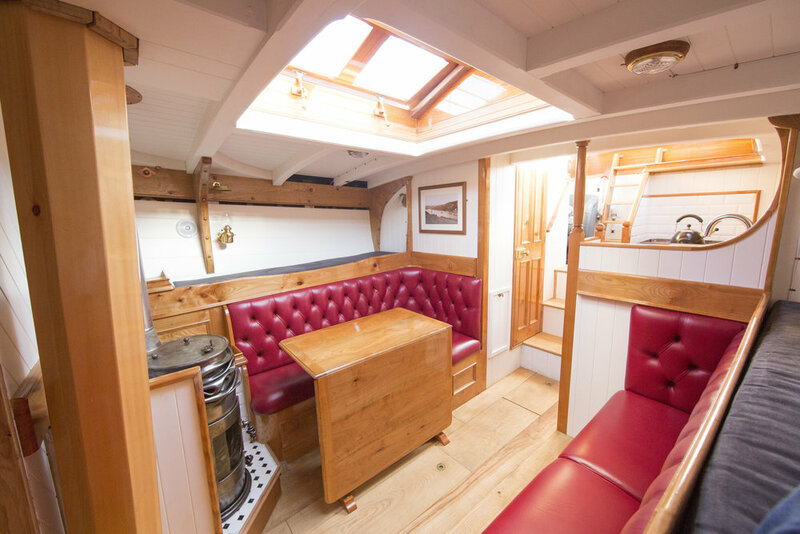 The spacious deckhouse provides shelter from the elements and is a perfect spot for a coffee on a chilly autumnal morning; from the deckhouse is the entrance to an owner's aft cabin with a double and single berth. 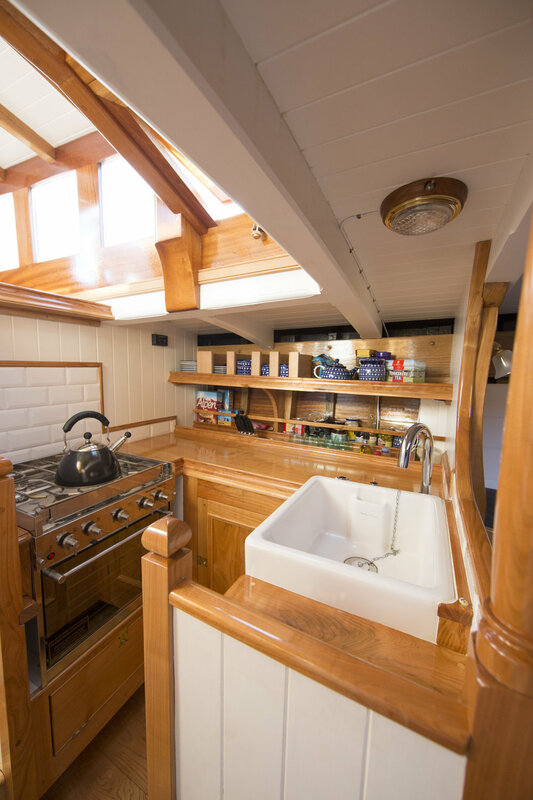 Forwards of the deckhouse is a compact but ergonomic galley and a heads with teak bath, a wonderful addition for anyone who may have felt the cold on passage. The interior then opens to a large saloon, truly the heart of the boat, kept warm and cosy in the winter months by a wood-burning stove and cool and comfortable in the summer thanks to her large central skylight. Further forwards still is space for a second heads, work bench and stowage, with 2 single or a v-berth arrangement in the forepeak. The blend of traditional workhorse and classic yacht is present throughout her construction. 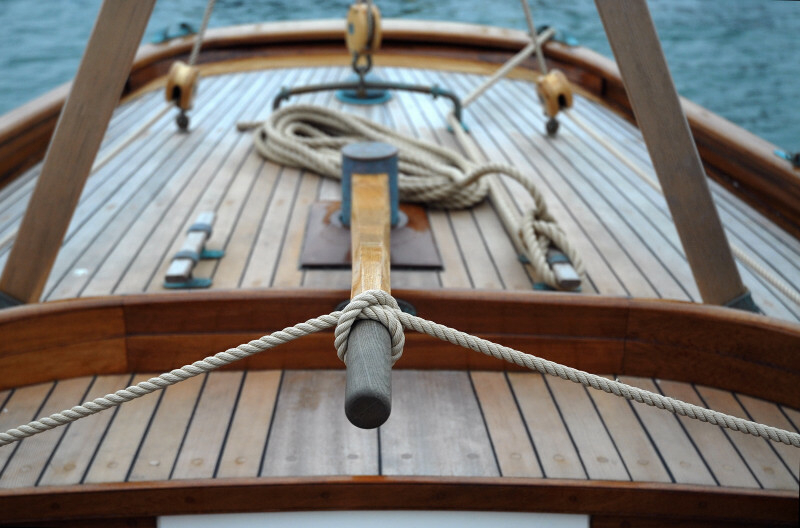 A combination of English oak or Iroko sawn frames, interspersed with steamed ribs, gives the hull strength while maintaining lightness and speed. 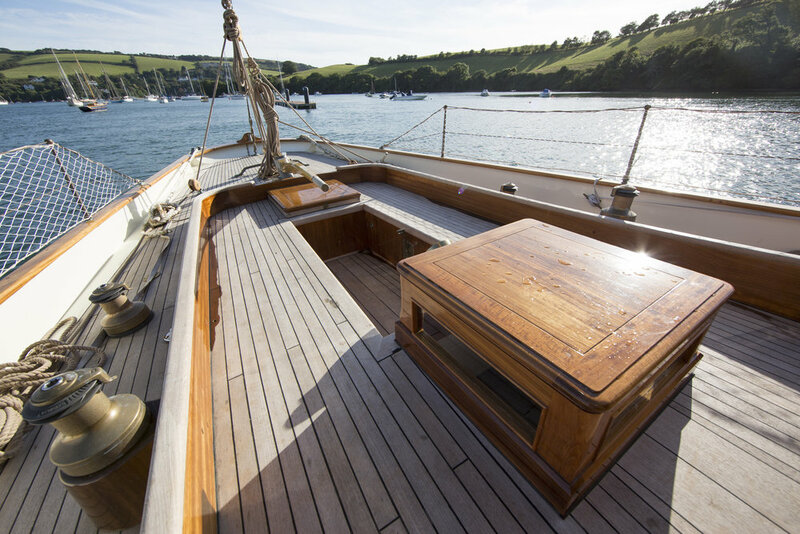 Her centreline is Iroko or English oak and the Mayflowers are planked in Iroko, ensuring a robust and durable hull. Deck construction can be fully traditional, 2" quarter-sawn Douglas fir, or a modern alternative of a plywood sub-deck with teak overlay. Traditional carpentry techniques are used to build beautiful butterfly skylights, ensuring the Mayflower is light and airy below, while double glazing minimizes traditional issues of condensation and heat-loss. "The perfection of a yacht's beauty is that nothing should be there for only beauty's sake"
The three Mayflowers built so far are as unique as their owners. Lyra at 38ft is petit and perfectly formed; a snug and cozy space for weekends and short cruises, full of old yacht charm and an easily manageable vessel. The two 50ft Mayflowers are as different as chalk and cheese; one the ultimate in luxury sailing, the other a cosy, self-reliant home from home. Lyra is a little gem of a vessel. She is the smallest and first of the Mayflowers, launched in 2009. Petit but perfectly in proportion she is a work of art, immaculately behaved and sails like a dream, inspiring immense confidence in her crew. On deck, her sunken cockpit makes for a secure helm position that Claude Worth would have been proud of. Her interior is surprisingly spacious; 2 berths in the forepeak, a further 2 in the saloon and a separate heads allow privacy for guests aboard. Upon descending the companion way, her appearance is clean and unobstructed, that of a gentleman's daysailor. Her saloon is beautifully finished in leather with contrasting cabinetry, which cleverly hides her galley. Handy, practical and stunning, Lyra is just the vessel, whether your plans are a weekend away or a brief, afternoon sail. Bonaventure's owner loved the artistry of Lyra and initially spoke to Butler & Co about a 40ft before deciding 50ft was necessary to fit all the family aboard! Her design brief was for all the home comforts, and there is very little that you wont find aboard this well-appointed vessel. With central heating to keep the autumnal chill away and even a bath for relaxing after a strenuous passage, you feel right at home; while behind the scenes clever and practical planning ensure that sailing performance has not been compromised. Her rig is Bermudian cutter and is imposing and powerful but easily manageable; while roller furlers, well thought out control lines and powered deck winches making sailing her light work, even for those still finding their sea legs. Although built to the same lines as Bonaventure, Martha Primrose has a distinctly different feel. Her gaff yawl rig is easily manageable short-handed and her systems are simple, fitted for necessity with nothing more than needed; perfect for those looking a reliable, long distance cruiser. Since her launch she has proved to be a comfortable liveaboard and has cruised single-handed to the Mediterranean, setting some impressive daily runs along the way.